and it's a lot of fun and easy to do. 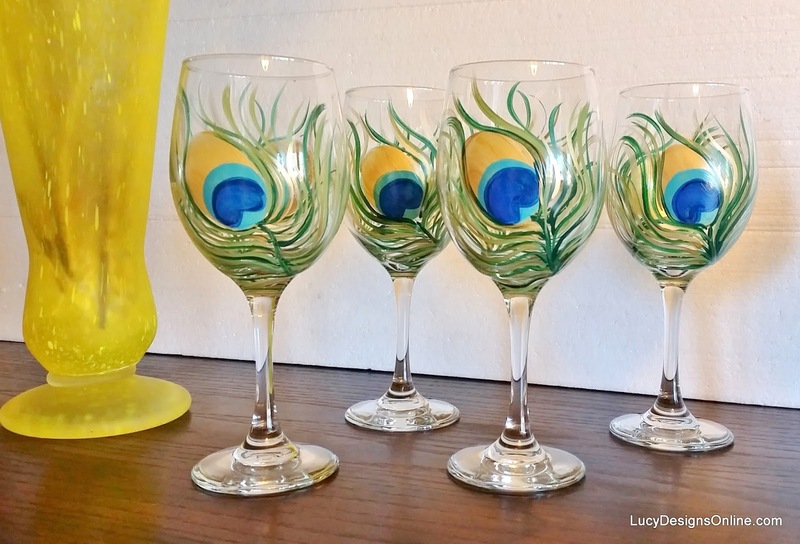 I found these great 20oz Libbey wine glasses at my local Dollar store. I have a bunch of different colors and brands of glass paints on hand. They all require baking in the oven after curing to make them more durable. depending on the color I needed. use the lower of the two and it should be fine. on the inside, so you want it to look pleasing from that angle. This shows the start of the feather and I used metallic gold for the first coat. Any metallic gold glass paint will be too sheer with just one coat. and let dry then end with a final coat of the metallic gold. This will give you the opaque metallic gold base for the feather. working on more than one glass. like the one in this photo, makes it super simple. I started with the feather stem and swirled it around to the other side. I definitely love peacock feathers! I started adding the rest of the feather using a long liner brush. This type of brush makes it easy to apply long, sweeping strokes. blue, purple, gold or whatever look you are going for. For the final touch, I added strokes of metallic gold. are painting over is dry or it will lift the paint up...don't want that. paint directions for added durability. 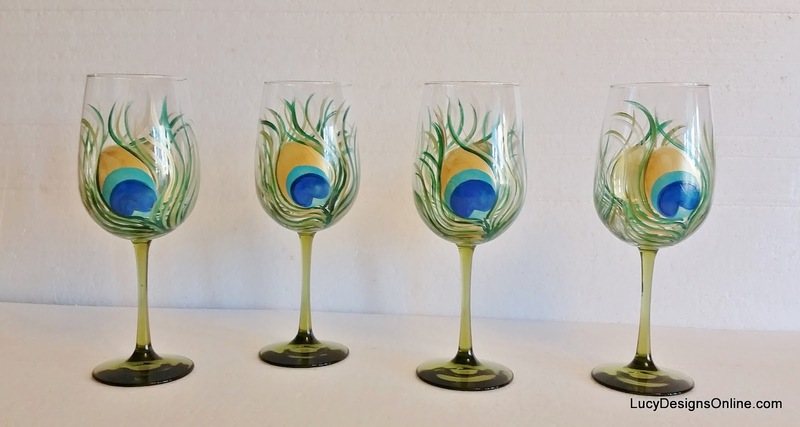 Sold out and I'm no longer creating the wine glasses. Thank you! Paint your own or visit my Etsy store, I usually have sets of four listed there. 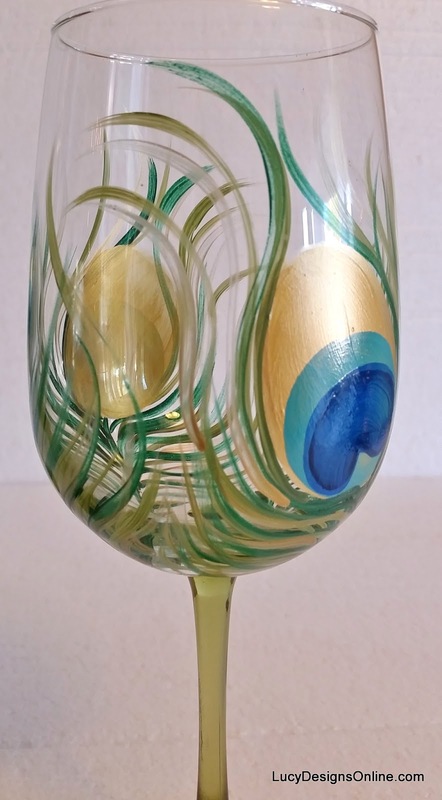 this design on the stemless wine glasses. Thanks for stopping by and reading about my wine glasses! Visit my new online store featuring my mosaic art.! You can also find me on Facebook, Instagram, Youtube and Pinterest too. Beautiful! I have the paint. I have the brushes. I have the glasses. Now, do I have the talent?!? 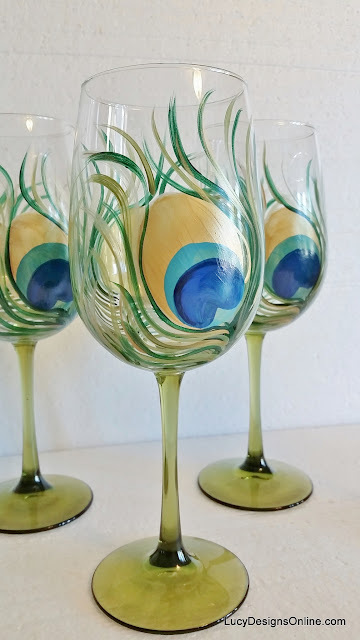 :) I paint wine glasses often but tend to be fairly conservative and do the same things over and over again. These look like such fun to try! Beautiful as usual! BTW, my momma loves these. 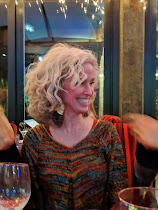 She had seen them when I liked them on FB. She is kinda new to FB so I showed her how to like your page so you have another new fan! These are just fabulous! and you are too generous to show us how to paint them! Thank you. Now, what did you use to put over the paint so that it wouldn't wash off? Thank you so much for this tutorial! It is great, and I've made a few sets as gifts! I'm having trouble with one thing, though- one coat of the gold is too sheer. When I add a top coat, it gets sort of "chunky" or shows lines. I have tried a few different paint brushes. The people who received these as gifts loved them, even if my finished product is not as polished as yours. :-) Thank you! Yes, one coat is too sheer, I do 2 or 3 of the gold. Mine have a little "texture" on them from the coats of paint, but I don't think it's too noticeable. I use a filbert (sometimes called oval) brush for making circular patterns like the center of the feather. Are you doing multiple layers for all of the design? Excellent!!! I was looking for a post on how to paint on glass and you answered every question! Thank you! May i use nail-paint for painting on glass? I dont know about kind of paint you used. Can u help? I really want to paint on my glass.